I was out walking one morning a few years ago and I found this message scrawled in chalk on the sidewalk by a student at Earlham College. I whipped out my camera and captured it, and I’ve been enjoying it ever since. Quakers have so much going for us – what we believe, what we do, the way we live together as a religious community. We have a proud and deeply moving history, a worldwide fellowship, and a presence in the Triad which goes back nearly 250 years. Springfield Friends were here 3 years before the Declaration of Independence! Quakers have a simple, streamlined faith, based on our experience of the Holy Spirit. We don’t have a creed. We believe that what takes place in our hearts is more important than any outward ceremony. Unlike many other churches we don’t have any physical sacraments like baptism or communion. We feel that every moment can be a special opportunity for us to be close to God. Quakers believe that God speaks directly to our hearts, helping us to understand the Bible, follow God’s leadings, and shapes the life of our church community. Part of every worship meeting is set aside for quiet prayer and listening to God. Quakers believe that every person is called to be a minister. We encourage people to speak out at worship and to testify in everyday life to God’s love. Many of the people at Springfield are deeply involved in various ministries, either as individuals or through the meeting. Quakers have also challenged the rest of the world about the equality of people of all races and backgrounds. We were pioneers in fair treatment of Native Americans, and many Friends risked their lives and freedom on the Underground Railroad. After the Civil War, Friends in the Triad were the center of an international effort to build schools, introduce modern scientific agricultural practices, and train teachers and leaders. Like many other Christians, Quakers believe that Jesus Christ is the Prince of Peace. In time of war, many Quakers have been conscientious objectors. Others have done relief work, trained as conflict mediators, become counselors or taught in prisons or conflict-prone areas of the world. Quakers are also deeply impressed by Jesus’ commitment to telling the truth at all times. Quaker honesty and fairness in business led to many Quakers being trusted by others. We believe that God knows what is best for the church. God can lead ordinary people and provide us with concrete guidance. At our business meetings, the majority doesn’t rule; instead, we pray to seek God’s will, and we take as long as necessary to seek it. 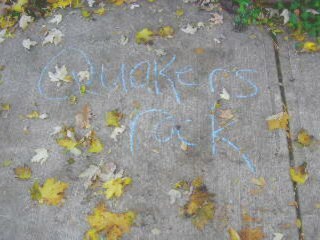 Yes, Quakers rock! We believe that this is one of the very best ways to be a Christian in today’s world, and we welcome other people to come seek God’s way with us.